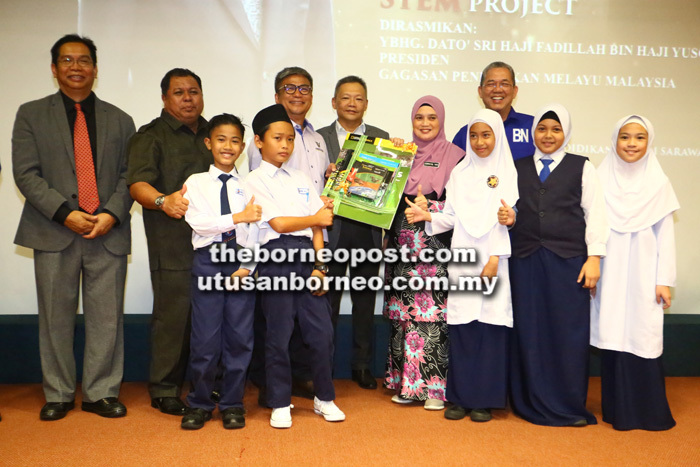 KUCHING: Seven schools in Petra Jaya received educational study kits from the National Geographic STEM Project yesterday to spur their interest in Science, Technology, Engineering and Mathematics (STEM) subjects. Witnessing the handing-over ceremony was Minister of Works Dato Sri Fadillah Yusof, who earlier in his speech pointed to the importance of STEM subjects to the development of the state and country and be competitive in the era of Industrial Revolution (IR) 4.0. “For Malaysia, we are aiming to have at least 60 per cent of university students pursuing their studies in STEM subjects,” said Fadillah, who also handed prizes to the winners of the state-level Mathematics and Science Olympiad Competition at the State Education Department’s auditorium. To become a productive nation, Malaysia, he said, must have the human capital especially in the Research and Development (R&D) sector. Currently, he added, the nation is still depending on imports from other countries such as smartphones and other electronic gadgets that are flooding the local market. “We have to focus on what the types of research that are needed in Malaysia and Sarawak. This will also open up new economic and job opportunities for the state,” said Fadillah, who is also Petra Jaya incumbent MP and president of Gagasan Pendidikan Melayu Malaysia. In view of the IR4.0, he said the world in 2020 will dive further into the Internet of Things (IoT), Artificial Intelligence (AI), Virtual Realty (VR) and the Big Data. “These are all the new technologies that our students should master to face the stiff competitions in the future. In that context, where is our position? Can we prepare our students to prepare for IR4.0 and be competitive?” he asked. Also speaking at the event was Assistant Minister of Education and Technological Research Dr Annuar Rapaee, who said the competition attracted the participation of 870 students from more than 100 schools in Sarawak. “So far, the number of participants in Sarawak is the highest in Malaysia,” said Dr Anuar, who is also Gagasan Sarawak chairman. He added that the performance of the students in the competition had shed some light on the quality of education among students in the rural and urban areas. “We have seen that there is not much gap, which reflects the effective policy of the education system in Sarawak,” said DR Annuar, who is also Nangka assemblyman. Meanwhile, the seven schools that received the National Geographic STEM Project study kit were SK Semerah Padi, SK Gita, SK Rakyat Tupong, SK Combined, SK Merpati Jepang, SK Petra Jaya and SK Madrasah Datuk Haji Abdul Kadir Hasan. For the Olympiad competition, the top prize for the Science category went to Nazmi Ahmad Nizar from SM Sains Kuching Utara who won himself a prize money of RM1,000 while the second and third prizes went to Khairul Hasli Mahli from SMK (A) Tun Ahmad Zaidi (RM700) and Qaedi Fakhrullah Merudi from SMK (A) Miri (RM500). In the Mathematics category, the top prize went to Jesslynn Loo Shi Lin from SMK Methodist Sibu (RM1,000). In second and third place respectively were Emilie Wong Sing Yee from SMK Padungan (RM700) and Valerie Lee Sze Ying from SMK Green Road (RM500).